"I was not pure. The teleporter insists on inner pure. I was not pure. " Really, what is there to say here? Is this a scene from Jurassic Park or is Mr. Goldblum auditioning for a role in the rumored Top Gun sequel? Like a peacock showing his feathers, Mr. Goldblum gets down to business here and lets everyone know exactly who's on the hunt. Remember those restrictive eyeglasses from earlier in the movie? Gone. Notice the suggestively placed railing? That ain't no accident. 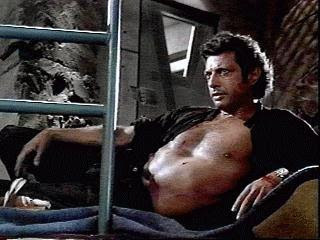 And, for the coup de grace, Mr. Goldblum plays the age-old but proven "Is it hot in here or is it just me?" card and says to hell with buttoning up his shirt. If I'm not mistaken, there's even a hint of "Oops, I forgot to shave and now suddenly look like a smoldering lumberjack." I guess the only real question is...who is this playful little masquerade aimed at? The lesbian paleontologist? Dr. Grant? Nedry? The girl?.......................the boy? Whoever it is, they're about to be on the receiving end of some good old-fashioned chaos theory. your pieces...and when the timing is right... you strike." After finding himself on the prowl for the first time in years after his slightly more feminine life partner gets blown up (the portly bearded gentleman who theatrically decided to forgo telling his lawyer of the impending alien attack), he sets his sights on a more exotic target. Sure, he can play the nerdy second fiddle for the better part of the movie, but eventually, he's gonna let his gold bloom. 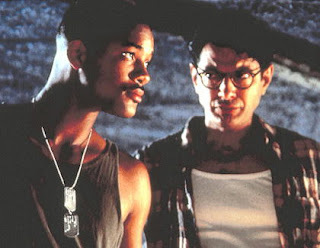 In this screenshot from the aptly-named Independence Day, he lies in wait for his moment to pounce upon the aloof, arrogant, and deeply-in-the-closet hero of the film. All he needs is a cigar, a bottle of whiskey, and the chance to be with The Fresh Prince thousands of miles away from any other human being in existence. This all conveniently comes to fruition not long after this snapshot, luring his prey in with his gentle, knowing advice of "Forget the fat lady. You're obsessed with the fat lady!" morphing into thunderous commands to his newfound black steed of "Must go faster! Must go faster! Must go faster! Go, go, go, go!" The rookie had no chance against this coy queen's patented smooth operating. In case you're not convinced, I'll leave you with this little snippet from another Goldblum classic, Igby Goes Down. That's right, that's the actual name of the movie. Before Mr. Goldblum signed on, it was simply titled "Igby." Need I say more?